What is Ring Floodlight Cam? Ring Floodlight Cam is a motion-activated HD security camera that includes two floodlights, Remote-activated 110-decibel alarm and two-way audio with noise cancellation. With Floodlight Cam you can see and hear any activity and speak with anyone in range of your Floodlight Cam. What are the features of Floodlight Cam? Note: Floodlight Cam comes with a free tool kit and the mounting accessories needed to connect it to any standard junction box. -22°F to 120°F (-30°C to 48°C). Floodlight Cam is available in black or white. Note: This is a soft-white glow that’s ideal for capturing crisp HD video at night and can easily replace your existing floodlights. I'm not in the United States, will my Floodlight Cam conform to local building and power requirements? Yes. The Floodlight Cam packaging for other countries differs from our US packaging, and will include equipment that complies with all of the building and electrical requirements for your home countries. Can Floodlight Cam operate on battery power? No. In order to support its robust array of features, Floodlight Cam needs to be hardwired into a standard junction box. Note: As Floodlight Cam requires a junction box as well as wiring up live wires, it's highly recommended you hire a licensed electrician to install Floodlight Cam. Can Floodlight Cam operate on alternative power options such as a solar panel? No, although Ring is constantly working to introduce new products and features for our products, so stay tuned! Is Floodlight Cam compatible with EU, UK, and Ireland voltages? Yes. Floodlight Cam has a built-in power adapter designed to support up to 240 volts. What do I need to install Floodlight Cam? If you already have an existing wall-mounted floodlight, you can easily install Floodlight Cam into the existing junction box using the mounting bracket we provide. Note: Installing Floodlight Cam requires hardwiring hot, or live, wires into a standard junction box. Ring highly recommends that you engage a licensed electrician for this. Can I install Floodlight Cam upside-down or horizontally? No. Floodlight Cam is designed for wall-mounted installation only. Can I install a junction box myself? If you do not already have a junction box, one can be installed, however, Ring highly recommends that you engage a licensed electrician for this. You'll want a 4-inch round waterproof junction box for use with Floodlight Cam. Ring is currently developing a junction box kit that will be compatible with Floodlight Cam. How high should I install my Floodlight Cam? Nine feet (three meters) off the ground is the optimal height to get the best range for the motion detector. With the motion detector parallel to the ground, Floodlight Cam optimized for detecting human-sized objects up to 30 feet (10 meters) away. Why is Floodlight Cam set to 2.4 GHz instead of 5 GHz? Floodlight Cam is only compatible with 2.4 GHz frequencies. Because your Floodlight Cam will be mounted outside and far away from your router, this wider range will help eliminate interference and ensure that your Floodlight Cam always performs at its best. What Wi-Fi networks is Floodlight Cam compatible with? Floodlight Cam is compatible with all 802.11 b/g/n Wi-Fi networks operating on a 2.4 GHz frequency. What is the recommended Internet speed for Floodlight Cam? Does Floodlight Cam have a dusk-to-dawn feature? Yes. Through the free Ring App, you can create a custom schedule for your floodlights. Using the app you can schedule your lights to turn on at dusk and turn off at dawn, or you can create any other combinations to fit your personal schedule. Can I control the floodlights? Floodlight Cam gives you the option to manually control the lights with the free Ring app. While the lights will automatically turn on at night as soon as Floodlight Cam detects motion, you can also use the app to manually turn the lights on or turn them off. As long as Floodlight Cam is connected to a Wi-Fi network, you can control the lights from anywhere. Can I dim the floodlights? No. A dimming option is not available at this time, but stay tuned for future updates! If I connect Floodlight Cam to a light switch, can I use the switch to turn on the lights? Yes. You can use your light switch to turn the lights on by flipping the switch off, and then quickly on again. This will reboot the camera and keep the lights on until they are manually turned off in the ring app. Do I have to have a Ring Video Doorbell to use Floodlight Cam? No, your Floodlight Cam, like all Ring devices, can operate as a stand-alone unit. Ring products are, however, designed to work together to create a "Ring of Security" around your home. Is Floodlight Cam compatible with Ring Chime and Ring Chime Pro? Yes, Floodlight Cam is compatible with both Ring Chime and Chime Pro. Is Floodlight Cam compatible with smart home devices? You can also use IFTTT to connect with many other devices to get the most out of your smart home. Floodlight Cam comes with two types of motion detection. Passive infrared sensors: These are the sensors that control your floodlights and tend to be more sensitive to the heat of bodies passing through your yard. Advanced motion detection: These sensors (which include human detection features) can be configured to only send you alerts when it detects people. With the free Ring app, you can choose to turn on or off the motion detection for your floodlights and/or camera, and you can also customize the sensitivity of your motion sensors, so you can find your ideal setting. How do I adjust the different detection zones for the lights? The floodlights are divided up into three 90 degree zones that can be independently turned on or off and the distance adjusted to customize the area that will trigger the lights to turn on. The camera too can have its motion-sensing area customized through the Ring App and can cover up to three different zones. 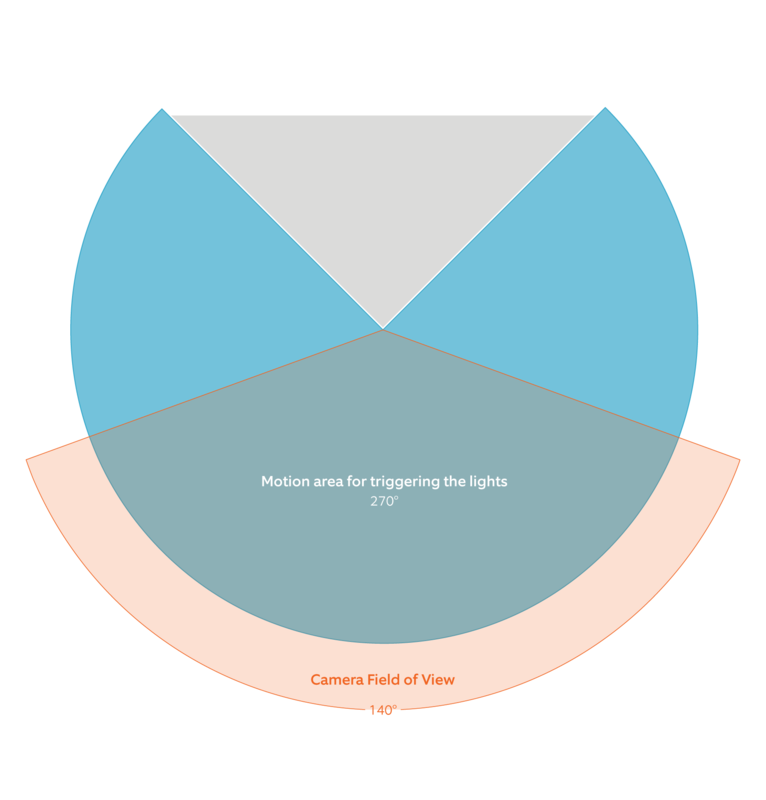 The combination of these different customizable zones gives you complete control over the area you wish to cover with your Floodlight Cam. Note: You will not receive any motion alerts until you set at least one motion zone. Does Floodlight Cam run 24-hours a day? Only if you want it to. Motion scheduling is a feature that allows you to disable motion alerts during a specific day and time. If, for example, your garbage is collected at 7:15 AM every Tuesday, you can schedule your camera's motion detection notifications to turn off for that period. Does Floodlight Cam use data all the time or just when it's activated? Floodlight Cam will only use data when it’s activated by an event or when you access the camera or lights via the Ring app. If Floodlight Cam doesn’t detect motion or isn’t activated with the app, it won’t use your data. Does Floodlight Cam keep footage for later review? Are there plan options if I have more than one Ring product? Basic: Under this plan, you'll be charged for each Ring camera. Protect Plus: Under this plan, you'll only be charged a flat rate for an unlimited amount of Ring cameras. For more information on Ring Protect Plan plans, check out Subscribing to Ring Protect Plan. Where can I order Floodlight Cam? Does Floodlight Cam have a warranty? Yes. Floodlight Cam has a 1-year parts and lifetime theft protection. What if someone steals my Floodlight Cam? If stolen, we will replace your floodlight Cam for free. Simply send a copy of the police report to theft@ring.com and we’ll ship you a replacement Floodlight Cam.